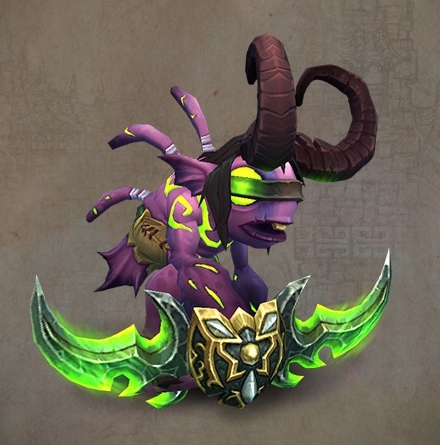 "Are you prepared for buying your BlizzCon 2015 Virtual Ticket and get your Murkidan Limited Edition Pet?" ONCE ORDERED YOU WILL RECEIVE AN OFFICIAL GIFT LINK FROM BLIZZARD WITH YOUR TICKET INFORMATION WITHIN 24 HOURS. Limited to 1 per Battle.net account. Content is broadcast in English language only. The BlizzCon stream is broadcast in Pacific Time. Replays available for 2 weeks after the event. Review the Blizzard Gear Store's Shipping policies for limitations. 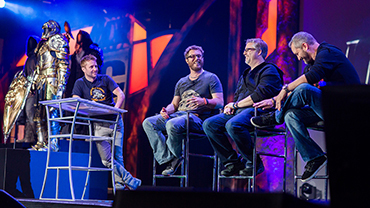 The Virtual Ticket gives you a front row seat at BlizzCon 2015 from the comfort of your own couch, live and in high definition (720p). You’ll get comprehensive coverage of both days of the show, including panels, contests, interviews, the closing ceremony, and more, along with some cool commemorative in-game goodies. You can even stream the convention using the free BlizzCon Guide mobile app! 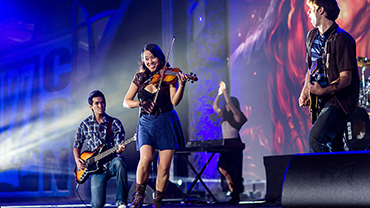 This year's BlizzCon takes place November 6 & 7 in Anaheim, CA. Want the latest and greatest info on all things World of Warcraft, StarCraft II, Hearthstone, Heroes of the Storm, Diablo III, and Overwatch? The Virtual Ticket is the only way to access all of the developer panels at BlizzCon from home. You’ll also see tons of interviews with the designers, artists, and key creative folks behind your favorite Blizzard games. Don’t miss a minute of the craftsmanship, skill, and creativity on display in the legendary Costume Contest and epic Talent Contest on Friday night. After two full days of Blizzard gaming excitement and fast-paced eSports action, you won’t want to miss the closing celebration. Stay tuned for more details about what’s in store for this year’s show. Every BlizzCon, we give out awesome in-game loot to commemorate the occasion, including pets, portraits, and more. Purchase a Virtual Ticket, and after BlizzCon begins you'll have access to a treasure trove of in-game goodies for your favorite Blizzard games–more details to come! Miss a revelation during a World of Warcraft or Heroes of the Storm developer discussion? Does one of your Hearthstone panels conflict with a must-see StarCraft II match? 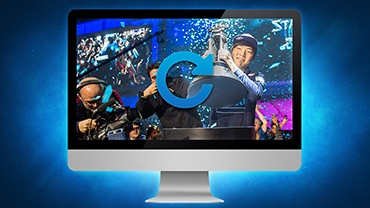 No problem—with the Virtual Ticket, every channel will be available to view on demand for 2 weeks after BlizzCon, so you can check out any action you missed—on your desktop or in the free BlizzCon Guide mobile app. Bring another piece of the BlizzCon experience home! 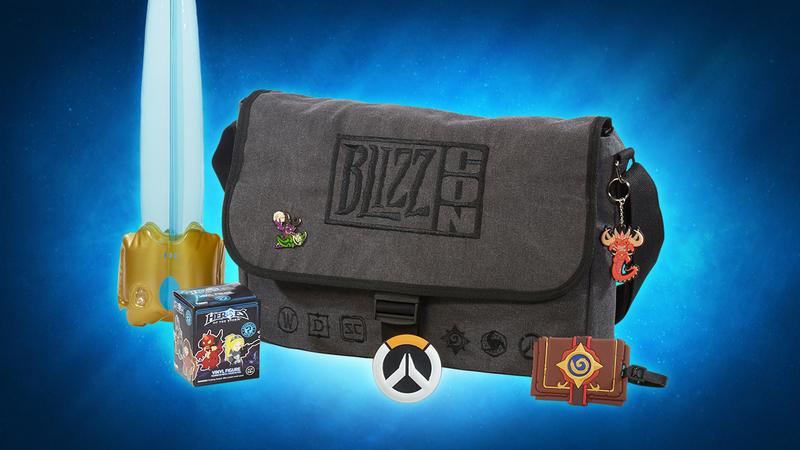 Order a Virtual Ticket and you’ll have the option to pre-purchase a BlizzCon Goody Bag from the Blizzard Gear Store. Supplies are limited, so snag one before they’re gone! 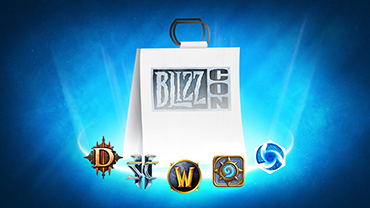 You'll also get access to the Gear Store's BlizzCon merchandise sale, scheduled to take place October 16–November 8. 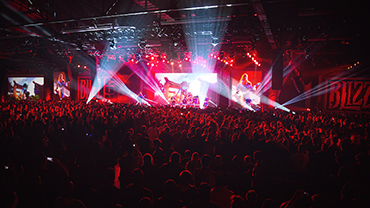 Visit BlizzCon.com for more details. Note: Physical items cannot be shipped to certain countries, e.g., China, Brazil, or Argentina. Review the Gear Store's shipping policies for more info.